Your diet has a huge impact on your health, particularly influencing your risk for things like heart disease, the leading cause of death worldwide. Your genetics equally contributes to your risk for heart disease the same as your diet, your environment and overall lifestyle does. Understanding your risks can help you take the right actions to stay as healthy as you can. With heart disease, the simplest ways to reduce your risk is with diet and exercise. A recent Spanish study published in the New England Journal of Medicine showed that changing what you eat may go a long way at protecting you from heart disease. 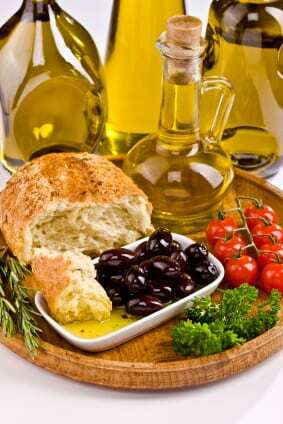 The study suggests a Mediterranean diet – which is rich in vegetables, fruit, legumes, fish, olive oil and nuts – can significantly reduce the risk of death from heart attack or stroke in people at highest risk. A Mediterranean diet could ward off heart disease, but how does it effect whether you gain or lose weight? Your genetics can influence how your body metabolizes and uses food. This explains a bit about why some people have a much easier time losing weight than others. The study gives hope. The researchers looked at more than 7,000 Spaniards who were overweight, smoked or had other conditions that put them at them at higher risk for heart disease. The participants ranged in age from 55 to about 80. Researchers at the University of Barcelona separated the participants into three groups, one on a Mediterranean diet, another group that were on a Mediterranean diet that included additional extra virgin olive oil, nuts, fish, vegetables, fruit and wine. And a third group that was simply advised to stay on a low-fat diet. About five years into the work, the benefits of the Mediterranean diet were so strong – groups on the Mediterranean diets were 30 percent less likely to have a heart attack or stroke – that the researchers stopped the study early. While there are some caveats to the study, it strongly suggests a simple change in what you eat – independent of whether you lose weight or exercise – could significantly reduce your risk for heart disease. This is particularly good news for people who want to lower their risk but are having a hard time losing weight. While the benefits for this high-risk, elderly population of Spaniards seems pretty clear, what is less clear is whether changing to a Mediterranean diet would offer the same benefits for everyone. Because the study specifically looked at people who were at high risk for heart disease, it’s unclear if diet alone can reduce heart disease risk in the general population, too. Unfortunately the study also didn’t look at how people with different genetics might respond to the diet changes. We know genetics has a strong influence on your risk for heart disease, but we don’t know if people with different genetics would respond differently to this diet. Whether the benefits could apply to people who are at low risk is not yet known, but it probably couldn’t hurt to reduce the amount of sweets, saturated fats and processed foods in favor of a diet rich in olive oil, nuts, beans, fish, fruits and vegetables. The fact that the diet also includes a drink of wine with each meal is a nice bonus as well.